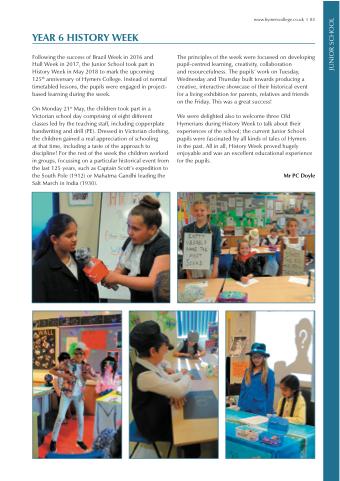 Hull Week in 2017, the Junior School took part in History Week in May 2018 to mark the upcoming 125th anniversary of Hymers College. Instead of normal timetabled lessons, the pupils were engaged in project- based learning during the week. at that time, including a taste of the approach to discipline! For the rest of the week the children worked in groups, focussing on a particular historical event from the last 125 years, such as Captain Scott’s expedition to the South Pole (1912) or Mahatma Gandhi leading the Salt March in India (1930). and resourcefulness. The pupils’ work on Tuesday, Wednesday and Thursday built towards producing a creative, interactive showcase of their historical event for a living exhibition for parents, relatives and friends on the Friday. This was a great success! We were delighted also to welcome three Old Hymerians during History Week to talk about their experiences of the school; the current Junior School pupils were fascinated by all kinds of tales of Hymers in the past. All in all, History Week proved hugely enjoyable and was an excellent educational experience for the pupils.